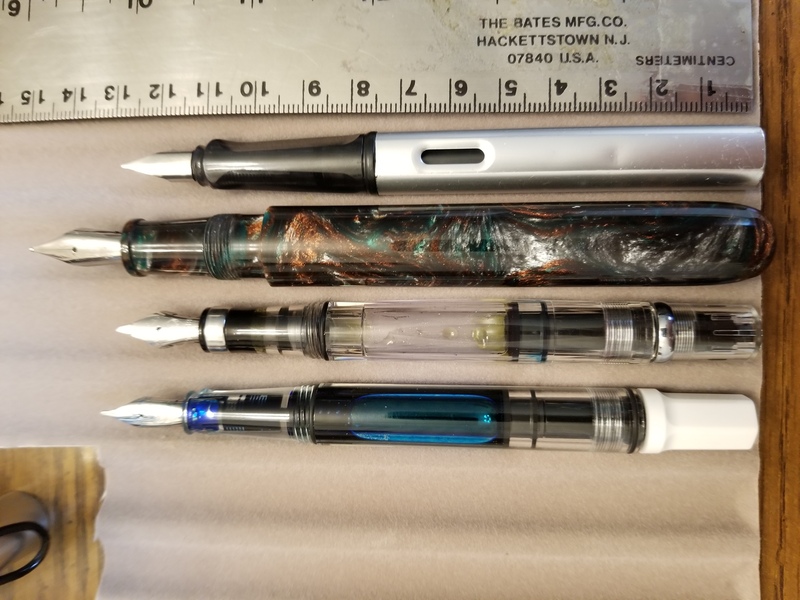 I've been a fan of Conid pens since I discovered them roughly a year ago. I have a regular demonstrator, the Monarch kingsize, and have ordered the new Cavens. But one that's always intrigued me was the Giraffe. Has anyone around here actually purchased one? How was it to use? 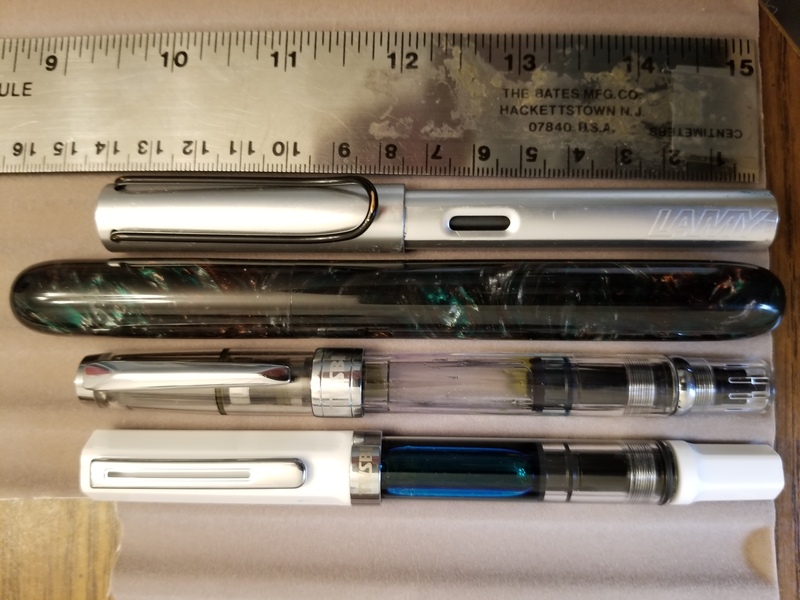 Alternately, does anyone use any other extremely long pens (the Giraffe is 191 mm, not posted according to the Conid site)? I'm really tempted to get one myself, but I'm just wondering if something that long and narrow is practical to use at all. Edited by Joe124013, 24 September 2018 - 12:00. 191 cm is, indeed, a very long pen. With the cap posted, I guess it's well over 2 metres. One would need a camel to carry the pen for him/her. Please post some pictures of the Cavens pen when you get it. The ones on the site really don't show off the pen. (I have two conids, and have wondered the same thing about the giraffe). The Giraffe is indeed a large pen! The only pen I have seen come close is the Onoto Mammoth that Onoto brought out a few years back, so named because it had some mammoth tusk as part of the pen IIRC..
Out of all the Conids, the Giraffe is the most interesting to me, it is in the tradition of a desk pen I imagine, more so than a carry everywhere pen. Edited by JakobS, 26 September 2018 - 13:47. Out of all the Conids the Giraffe is the most interesting to me, it is in the traditional of a desk pen I imagine, more so than a carry everywhere pen. Yep. I agree and this pen has been calling me. I like long pens for sketching, since I tend to hold them far, far back while doing so. But for writing, I love the feel in the hand but don't really like the fact that I can never just use it in a breast or pants pocket, so while I love the giraffe too, I think I will just go for one of the more normal conids when I finally screw up the courage to buy one. I'd be more interested in the giraffe if it came with a cap for taking places AND a desk mount. I also really need to find a reasonably priced desk mount for my Mont Blanc 149. Edited by Honeybadgers, 26 September 2018 - 09:27. The pen I am illustrating here is the one with round ends. A Guider Capsule. It measures 158 mm capped. I have put it next to the three other longest pens I own. A Lamy Al Star, TWSBI Eco and TWSBI 580. Capped and uncapped. For reference a Pelikan M1000 is only 147 mm capped. Same with a MB 149. (The cap on the Guider is 60 mm long) Uncapped it is ~150 mm. (doesn't post) I know how difficult this was to adapt to, I can only imagine a pen over 30 mm longer than this. Great illustration, Runnin_ute. Very helpufl.